The Ancyra Blue was a new discovery for Singapore when it was first encountered on Pulau Ubin some time ago in June 2005. Since then, this species has been quite widespread in Singapore, from urban parks to the nature reserves. Like many of the Lycaenidae, it is a rapid flyer, often flying erratically amongst shrubbery, and resting with its wings folded upright on the tops of leaves. 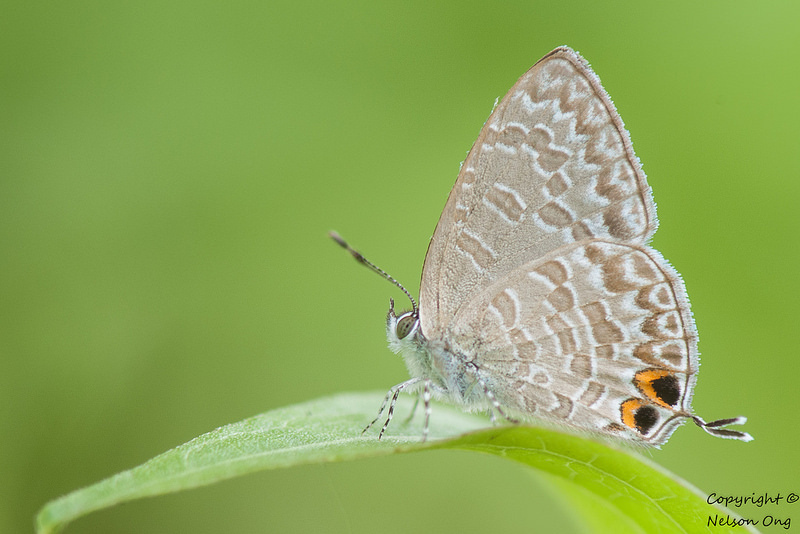 The shot was taken by ButterflyCircle member Nelson Ong at a wasteland site in the western part of Singapore. The species has characteristic thick striations on the undersides of the wings and if observed at rest, is quite easily to distinguish from the similar-looking species in the family. Its caterpillars feed on two local host plants and the life history has been recorded here.